Taking your kids to a Broadway show has become an American right of passage and these days, if you can’t make it to the Big Apple, the shows often come to you. We’ve compiled our picks of 2017’s most popular Broadway shows, and broken them up into two categories: For Kids Ages 6 and up, and Parental Discretion Advised (best for ages 13-up). Still, only you know your kids, so be sure to do your research before you fork over cash for tickets. Luckily, our guide is here to help. Another Disney classic comes to life on stage in all its bold, brash glory — complete with the songs you loved as a kid (that your kids are sure to adore, too). 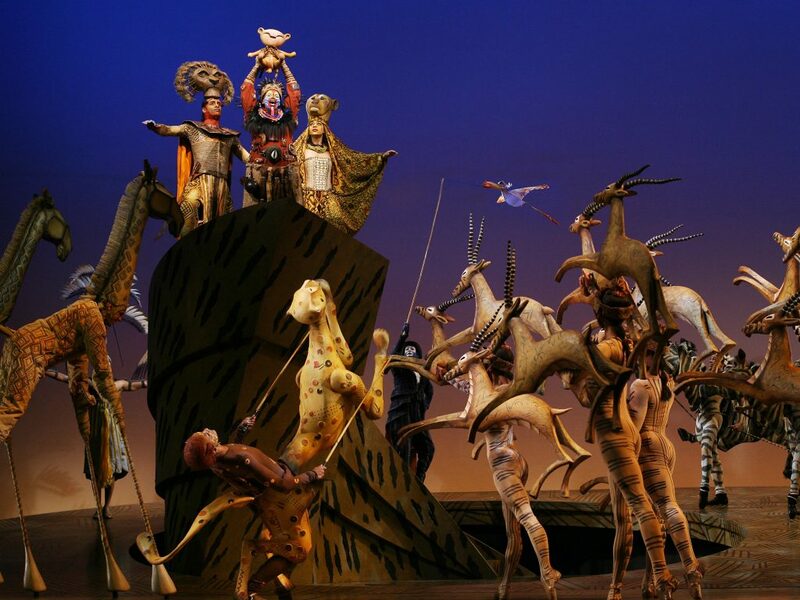 This show is a smash hit (and the highest grossing Broadway production — ever!) for a reason — its use of enormous puppets to tell Disney’s beloved tale makes it a thrilling watch for audiences of all ages. Wicked delves into the women of Oz, exploring the evolution of and relationship between two of the most iconic (fictional) witches in the world. The show is occasionally scary, so make sure your younger theater-goers feel comfortable with darker themes. Parents might remember Cats as an 80s sensation, but this recent revival has Broadway fans embracing all things Jellicle again. The songs, the make up, the movement — it’s even better than it is in your memory (pun intended, of course). Based off the classic film, this Broadway adaptation is incredibly kid-friendly, complete with all the songs you’ve been singing along to since childhood. Somehow, the musical version of this hit Jack Black movie is even more charming than the original. And the kids rock hard. The Little Mermaid ended its Broadway run in 2009, but a revamped touring show is breathing new life into this Disney children’s classic. While it’s remembered as a family-friendly classic, the show does also deal with adult themes — mainly the Von Trapp family fleeing the Nazi regime — of which parents should be aware. You’re off to see the Wizard in this stage adaptation of the beloved film, which comes with six new songs penned by Andrew Lloyd Webber and Tim Rice. No, it’s not the Disney version of Cinderella, but this classic musical is still full of magic, making it a fun show for the whole family to watch. I loved this well-done revival when I saw it on tour in Los Angeles, but be warned — the second act is on the longer side. Might be a show for the little ones to skip and save until they can sit in their seats without getting bored. A touching look at the untold story of the inspiration behind J.M. Barrie’s Peter Pan. While embraced by nearly all audiences, the actual tale of Peter and friends doesn’t feature much in the musical, and very young kids might struggle to stay engaged. It’s impossible not to sing along to this feel-good romantic romp, that uses ABBA’s catchy disco tunes to tell the story of a young woman’s quest to discover the identity of her dad before she gets married. Has there been a more buzzed about show in recent memory than Hamilton? The show, like it’s titular character, is revolutionary. Some little kids (like mine) may know all the words to the songs, but this one is best saved for older children, as strong language abounds, and themes of war and violence are a through-line of the show. This show, from the creators of South Park, is heavy on adult themes: religion, sexuality, and racism are all tackled with sharp wit, brilliant voices, amazing dance performances, and yes, crude jokes. Parents may want to check it out first before bringing their bigger kids along, or at least listen to the soundtrack so you know what you’re getting into! The show recently walked away with six Tony Awards, including Best Musical. And the accolades are well deserved, it’s an incredibly touching look at anxiety, suicide, and processing life’s heaviest moments as a teenager. With music and lyrics by Cyndi Lauper, this Tony-Award-winning show delivers an uplifting message with killer tunes.